By Thor Jourgensen, The Daily Item, photo by Owen O’Rourke. LYNN — Rayquan Fregeau wears diamond-encrusted boxing gloves on a necklace symbolizing his fight against cancer. 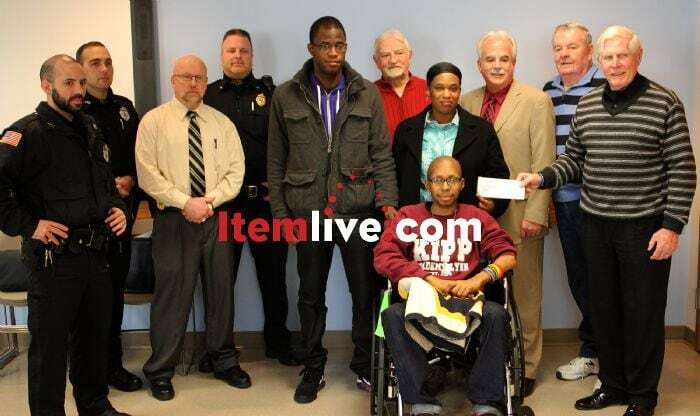 On Wednesday he got help in his battle from some veteran police officers. Retired Boston Police Superintendent-in-chief Robert Faherty and fellow Cops for Kids with Cancer volunteers joined Lynn police officers in donating $5,000 to Lynn resident Fregeau and his mother, Brenda Haynes. “This is amazing. We’re very grateful,” Haynes said. Fregeau, 18, has endured chemotherapy and radiation treatments during the last year following his rhabdomyosarcoma diagnosis. Haynes said doctors beat back the rare, soft-tissue cancer, but Fregeau received bad news recently when doctors confirmed his cancer —Haynes calls it “the dinosaur” — moved to her son’s spine. “It’s aggressive. It’s a beast,” she said. Haynes scaled back her nursing home job to three days a week to care for her son. Fregeau’s grandmother, Anita Haynes, and his cousin, Rayshawn Haynes, help him eat meals, take medicine and deal with other day-to-day needs. The donated money, Haynes said, will help pay her son’s extensive bills. “I feel good, but I get headaches,” he said. He attends the Knowledge Is Power Program school once a week, but teachers and school friends visit Fregeau frequently. “The teachers at KIPP are very supportive,” Haynes said. Dana-Farber Cancer Institute doctors passed Fregeau’s story on to Cops for Kids, an all-volunteer organization that Faherty said began in 1980 when an Irish and an American police officer joined forces to fight cancer. “Everyone knows someone with cancer in their life,” Faherty said. With money donated from fundraising events, Cops for Kids set its sights in 2008 on donating $5,000 to each family with a child undergoing cancer treatment. Cancer treatment hospitals help identify needy children and local police departments play a key role in helping arrange donations. Since 2008, Faherty, who serves as Cops for Kids’ board chairman, said the organization has donated $1.4 million to 275 families. “We’re doing fundraising seven days a week,” he said. Fregeau sometimes has trouble eating, but he enjoyed a recent trip to Georgia so much he abandoned his wheelchair for a walker. “I’m a fighter,” he said.